Join the discussion on our forums! Come discuss Sul'thraze over in our dedicated Sul'thraze discussion topic. Overkill: You may attack again. “Griftah here with de Sul’chop. One chop, you get four damage. Two chops, eight damage - you gonna change de way you fight." I was wondering... What happens if you overkill a minion with its last charge then equip another weapon? Will you be able to attack again? Because it says: Overkill: You may attack again. Makes sense, right? Did anyone try that? I discovered this with Stolen Steel then used my hero power after the 4th overkill. It does indeed allow you to attack again - up to 5 consecutive hits makes for a pretty hype removal tool if you have the health for it. I was expecting that would be the case. This card is really good. I did an arena run one of these days and drafted two of these. And they did an amazing job in clearing minions and helped with face damage as well. Really incredible. Thanks for the answer! I feel like this might be the key component for rush warrior. It's 16 damage to faace over 4 turns or occasionally a good way to wipe the board to get your minions to stick. Why the question mark? Being able to attack heroes for 1 more mana is definitely an upgrade! Think this card could help bring about the weapon/anti weapon meta Kripparrian was predicting for Kobalds and Catacombs. But would you really play 6-mana card in aggressive deck? And what is more important, what aggressive deck warrior currently has? Yea, there a lot of new cards incoming, but from this point there's none. There might be some pirates again, especially considering this expansion have some love to pirates, but NOW I don't see this card as VERY GOOD. Its just ok, might see play. 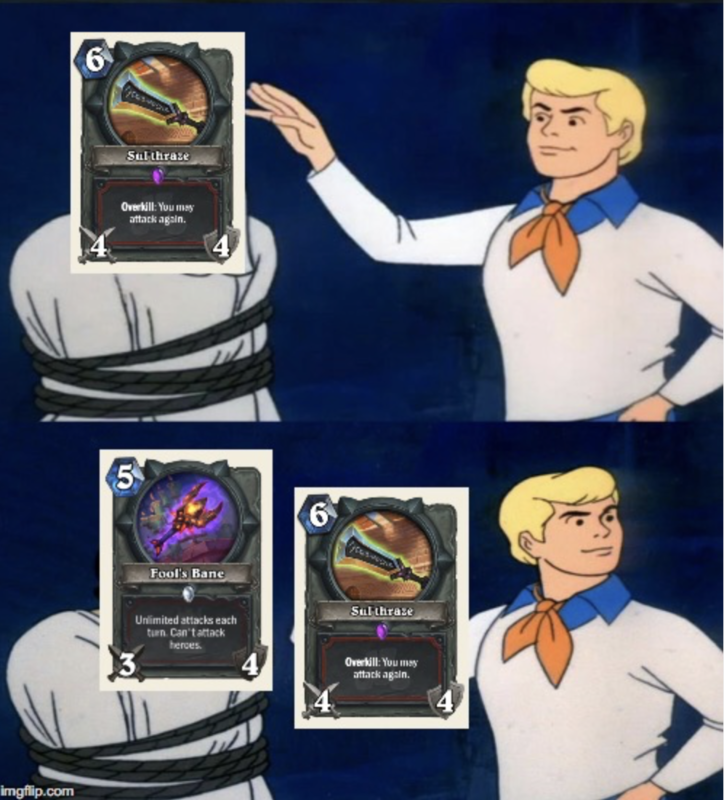 But I see it more as midrange card, which is not a thing in HS anymore. I might be too pessimistic or simply wrong, I don't insist on my point. But I don't see this card now as VERY GOOD. 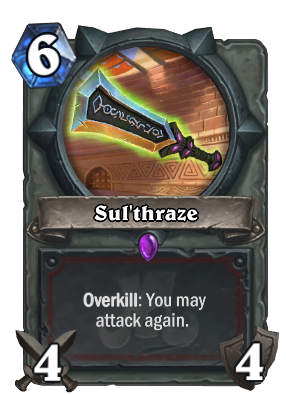 We'll see about this weapon... but one of the best aggro weapons is 7 mana Vinecleaver. Yeah I think I would play a 6-mana weapon in an aggressive warrior deck. It can be crazy strong. Imagine you play this, opponent plays Lich King, you play Heroic Strike and kill Lich King + hit his face for 8. Sounds pretty crazy. Problem is aggro warrior is pretty bad atm, I don't know if this card alone can bring it back. We're not missing that many cards to put aggro warrior at a decent tier 2 spot. Maybe you wanna build it more mid-rangy with Grommash, spellstones things like that, we'll see ! I really like the mechanic - wondering if they will add some health dependant minions for warrior now. F/e if your health is below 15 or something. Warrior can generate tons of armor later so still it could be good. Incredibly strong with weapon buffs, like Upgrade!. A 6 mana 4/4 weapon is already very good.